Comprising a six-suite 100-year-old farmhouse, a family lodge consisting of 12 interconnecting rooms, and two luxury tented camps, Sanbona Private Game Reserve unites the best of the old-world safari with the amenities and expectations of the twenty-first century. Situated along Route 62, in the arid Warmwaterberg Mountains of the Klein Karoo region, Sanbona is not only luxurious in its accommodation options, but also environmentally-friendly. One of the largest wildlife conservancies reachable from Cape Town by road (in just over three hours), the 58,000 hectare estate is home to many of Africa’s most iconic species, from lion and elephant, to rhino and giraffe. For this memorable South Africa holiday, we have combined staying in Cape Town with a malaria-free Big-5 game safari, not far from Cape Town too, plus some fantastic activities that are unique to the area including a helicopter flight over the Cape Peninsula and wine tasting at a wine farm. 5* hotels and lodge for this luxurious stay. The old farmhouse, Tilney Manor, consists of six spacious open plan suites, styled to the needs of the modern traveller in muted tones, each of which has its own private veranda. Similar in style is the thatched Gondwana Family Lodge, made up of suites of interconnecting rooms ideal for families. With a nod to this, there’s a children’s playroom inside, and another play area outside, along with a child-friendly pool. Nine luxury tents make up the year-round Dwyka Camp, with a further location, the Explorers Camp, available during the summer months of October to April. Dwyka’s tents offer an incredible array of facilities, from en suite bathrooms to heated Jacuzzis with decked area, while the Explorers Camp is a little more basic, with shared bathroom facilities, for those looking to experience the Little Karoo in greater depth. Sanbona’s turn of the century farmhouse, Tilney Manor, has been fully and luxuriously renovated to provide six airy open plan suites complete with private verandas looking out onto the stunning Karoo mountain landscape and indigenous garden. The richly decorated suites expertly echo the peace and tranquillity they seek to provide, allowing guests total relaxation between game drives and activities, whether from the outdoor dining facilities, shared therapy rooms, or the wooden deck that encloses the rim-full pool. Magically blended into the surrounding landscape in a horseshoe-shaped bend in a dry riverbed for a truly authentic yet secluded ambiance. Tranquillity is taken to another level at the Relaxation Retreat, while a splendid boma provides a shared space in which to dine and share stories across the campfire. Dwyka Tented Camp comprises just nine luxury canopies. While seven of the nine are furnished with king-sized beds (the remaining two offer twin accommodation), each has amenities that make a stay more than special – such as the private deck areas and heated Jacuzzis in addition to indoor and outdoor showers. This spacious thatched lodge has incredible views across to the Anysberg Mountains and over the Bellair Dam, while providing families and groups all the comforts of the modern world inside. The 12 authentically styled suite of rooms are interconnecting, while children are specifically catered for in the indoor and outdoor play areas as well as the child-friendly pool, ensuring the whole family can make the most of this stunning setting. The fully-qualified guides that lead the walk are there to point out the smallest of details while leading the two-day trail. The camp can be experienced between South Africa’s summer months of October and April, with departures every Friday. 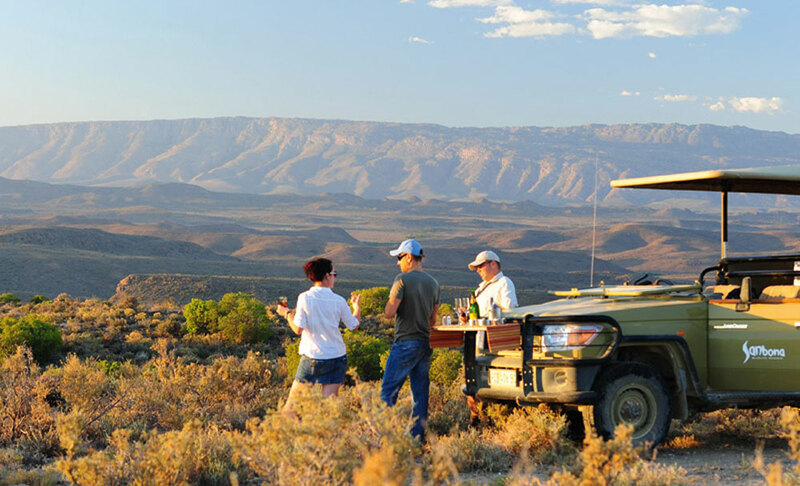 Part of a walking tour that explores the lesser visited areas of the Karoo, this season camp is made up of luxury tents on a shaded riverbed using shared bathroom facilities. An indigenous garden of endemic plants adds color and interest to Sanbona’s proximity, while the rim-full swimming pool and lounge area is a perennial favorite with guests. To take full advantage of the reserve’s five-star experience guests can also opt for spa sessions at Relaxation Retreat, while a boma provides a shared space in which to dine outdoors and share stories of the day’s adventures with fellow guests. The 58,000 hectares that make up Sanbona provide ample space for all the region’s wildlife. The expertise of the trained guides means guests are sure to experience the wonder of encountering majestic elephant and regal lion, to mention just two species, within their natural habitats, a guarantee that is hard to match in larger game reserves. There are daily game drives taking in the reserve in search of its free roaming animals, as well as nature walks through the surrounding bushveld, a particular highlight for bird lovers of all ages. Learn more about the night sky around the campfire as night falls, and then jump into a boat for a very special waterborne safari come daybreak. Want to see Sanbona as part of a package? Enquire today and we can help build your holiday.